McArthur Glen Designer Outlet, Swindon, England, a shopping mall built within a disused railway engine works. The grey girders are the original structure of the works. A shopping mall (or simply mall), shopping center,, or shopping arcade is a building or set of buildings that contain retail stores, with interconnecting walkways enabling visitors to easily walk from store to store. The walkways may be enclosed. In the British Isles and Australia, "shopping malls" are more usually referred to as "shopping centres" or, sometimes, "shopping arcades." In North America, the term "shopping mall" is usually applied to enclosed retail structures, while "shopping center" or "shopping plaza" refers to open-air retail complexes. The concept of a "mall" or bazaar with numerous shops located in one area, possibly covered, has a long history and has served all segments of society well. The advent of large shopping areas located out of the city center to be accessed by car, however, has led to changes, some beneficial some not. Such structures tend to take people away from the center of town, leaving the city-center bereft of the hustle and bustle of trading, and in some cases has led to increased crime. Small store owners, unable to pay the higher rents charged at new malls suffer loss of customers. Consumers, while finding the large shopping malls convenient, may find the abundance of goods tempting and spend more than their budget allows. Thus, as with all developments in technology, the shopping mall can be used for good or ill, and the final outcome depends more on the motivations of those involved than on the physical structures. 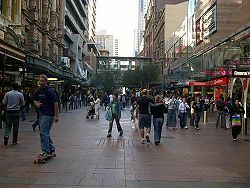 "Pitt Street Mall" of Sydney is Australia's busiest shopping precinct. This mall has eight retail centers and more than 600 specialty stores, within two city blocks. Mall can refer to a shopping mall, which is a place where a collection of retail stores all adjoin a pedestrian area, or an exclusively pedestrian street, that allows shoppers to walk without interference from vehicle traffic. "Mall" is generally used in North America and Australasia to refer to large enclosed shopping areas, while the term "arcade" is more often used, especially in Britain, to refer to a narrow pedestrian-only street, often covered or between closely spaced buildings. A larger, often only partly covered but exclusively pedestrian shopping area in Britain is termed a "shopping precinct" or "pedestrian precinct." The majority of British shopping centers are in town centers, usually inserted into old shopping districts, and surrounding by subsidiary open-air shopping streets. 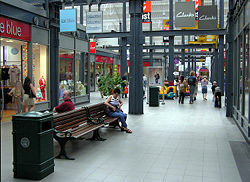 A number of large out-of-town "regional malls" such as Meadowhall were built in the 1980s and 1990s, but planning regulations prohibited the construction of any more. Out-of-town shopping developments in the UK are focused on retail parks, which consist of groups of warehouse style shops with individual entrances from outdoors. Planning policy prioritizes the development of existing town centers, although with patchy success. Indoor, multi-vendor shopping is an idea with a rich history. Popular malls throughout history include Isfahan's Grand Bazaar, which is largely covered and dates from the tenth century, and the 10-kilometer long covered Tehran's Grand Bazaar. The Grand Bazaar of Istanbul was built in the fifteenth century and is still one of the largest covered markets in the world with more than 58 streets and 4,000 shops. The Oxford Covered Market in Oxford, England was officially opened on November 1, 1774, and is still going strong today. The Arcade in Providence, Rhode Island introduced the concept to the United States in 1828. The Galleria Vittorio Emanuele II in Milan, Italy followed in the 1860s and is closer to large modern malls in structure. 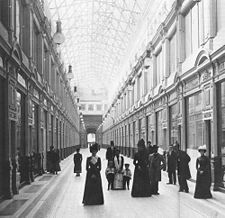 An example of the mid-nineteenth-century shopping mall: The Passage in St. Petersburg. In the mid-twentieth century, with the rise of the suburb and automobile culture in the United States, a new style of shopping center was created away from city centers. Early shopping centers designed for the automobile include Market Square, Lake Forest, Illinois (1916) and Country Club Plaza, Kansas City, Missouri (1924). The concept was pioneered by the Austrian-born architect Victor Gruen. The new generation called malls included |Northgate Mall, built in north Seattle, in 1950, Gruen's Northland Shopping Center, built near Detroit, in 1954, and the Southdale Center, the first fully enclosed mall, which opened in the Twin Cities suburb of Edina, Minnesota in 1956. In the UK, Chrisp Street Market was the first pedestrian shopping area built with a road at the shop fronts. A very large shopping mall is sometimes called a "megamall." The title of the largest enclosed shopping mall was held by the West Edmonton Mall in Edmonton, Alberta, Canada for 20 years. One of the world's largest shopping complexes at one location is the two-mall agglomeration of the Plaza at King of Prussia and the Court at King of Prussia in the Philadelphia suburb of King of Prussia, Pennsylvania. The King of Prussia mall has the most shopping per square foot in the United States. Comparable in size is Europe's largest shopping center, Dundrum Town Centre in Dundrum, Dublin, Ireland. The most visited shopping mall in the world and largest mall in the United States is the Mall of America, located near the Twin Cities in Bloomington, Minnesota. Beijing's Golden Resources Shopping Mall, opened in October 2004, is the world's largest mall at 600,000 square meters (approximately 6 million square feet). Berjaya Times Square in Kuala Lumpur, Malaysia, is advertised at 700,000 square meters. The Mall of Arabia inside Dubailand in Dubai, United Arab Emirates, set to open in 2008, will become the largest mall in the world at 929,000 square meters (10 million square feet). Cevahir Mall, Turkey, seen here with its six floors. In many cases, regional and super-regional malls exist as parts of large superstructures that often also include office space, residential space, amusement parks, and so forth. This trend can be seen in the construction and design of many modern "supermalls" such as Cevahir Mall in Turkey. A regional mall is a shopping mall that is designed to service a larger area than a conventional shopping mall. As such, it is typically larger with 400,000 to 800,000 square feet (37,000 to 74,000 square meters) gross leasable area with at least 2 anchors, and offers a wider selection of stores. Given its wider service area, these malls tend to have higher-end stores that need a larger area in order for their services to be profitable. Regional malls are also found as tourist attractions in vacation areas. A super-regional mall is a shopping mall with over 800,000 square feet (74,000 square meters) of gross leasable area, which serves as the dominant shopping venue for the region in which it is located. Example of a small "strip mall". A strip mall (also called a plaza) is an open-area shopping center where the stores are arranged in a row, with a sidewalk in front. 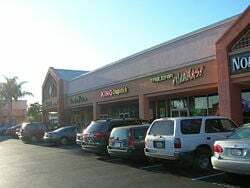 Strip malls are typically developed as a unit and have large parking lots in front. They face major traffic arterials and tend to be self-contained with few pedestrian connections to surrounding neighborhoods. In the United States and Canada, strip malls come in two sizes. The smaller variety is more common, and often located at the intersection of major streets in residential areas; they cater to a small residential area. This type of strip mall is found in nearly every city or town in the U.S. and Canada. They are service-oriented and will often contain a grocery store, video rental store, dry cleaner, small restaurant, and other similar stores. Sometimes, gas stations, banks, and other businesses will also have their own free-standing buildings in the parking lot of the strip center. The other variety of strip mall in the United States has large retailers as the anchors, such as Wal-Mart or Target. They are sometimes referred to as "power centers" in the real estate development industry because they attract and cater to residents of an entire population area. The type of retailers may vary widely—from electronics to bookstores to home improvement stores. There are typically only a few of these types of strip malls in a city, compared to the grocery store-anchored strip mall. Some of these strip centers may only have three or four of the large retailers in them, while others may have a dozen or more major retailers. Strip malls vary widely in architecture. Older strip malls tend to have plain architecture with the stores arranged in a straight row. Newer strip malls are often built with elaborate architecture to blend in with the neighborhood or be more attractive. In some cases, strip malls are broken up into smaller buildings to encourage walking. Sometimes the buildings will wrap around the parking lot to hide the parking from the road or residential areas. Due to land use issues, strip malls in the United Kingdom are typically found on the edges of cities on greenfield sites, and are known as "out of town shopping centres." Those in more urban areas are more typically known as "retail parks." The first shopping center (strip mall) in the United States was the Country Club Plaza in Kansas City, Missouri. One controversial aspect of malls has been their effective displacement of traditional main streets. Malls are seen as more convenient than public streets, with their spacious parking garages, well-maintained walkways, and private security guards. In response, a few jurisdictions, notably California, have expanded the right of freedom of speech to ensure that speakers will be able to reach consumers who prefer to shop within the boundaries of privately owned malls. 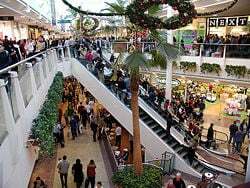 Criminologists have suggested that different factors affecting mall crime include the design of the mall, the location of the mall, and the security systems used by the mall itself and by the individual tenants. Crime was found to occur when the malls occupancy was lowest, when stores entrances were blind (hard to see from a wide open area), and when the store may have been extremely busy and, therefore, occupied. Suggestions at protecting stores from crime, during and after hours, involve stricter store security, better designed mall areas, lights on around the premises at night, and iron fences on the doors and windows of stores after hours. In the United States, as more modern facilities are built, many early malls have become largely abandoned, due to decreased traffic and tenancy. These "dead malls" have failed to attract new business and often sit unused for many years until restored or demolished. Interesting examples of architecture and urban design, these structures often attract people who explore and photograph them. Until the mid-1990s, the trend was to build enclosed malls and to renovate older outdoor malls into enclosed ones. Such malls had advantages such as temperature control. Since then, the trend has turned and it is once again fashionable to build open-air malls. Some enclosed malls have been opened up, such as the Sherman Oaks Galleria in Los Angeles, California. In addition, some malls, when replacing an empty anchor location, have replaced the former anchor store building with the more modern outdoor design, leaving the remainder of the indoor mall intact, such as the Del Amo Fashion Center in Torrance, California. In parts of Canada, it has become rare for new shopping malls to be built, as outdoor outlet malls or big box shopping areas are favored, although the traditional enclosed shopping mall is still much in demand by those seeking weather-protected, all-under-one-roof shopping. In addition the enclosed interconnections between downtown multi-story shopping malls continue to grow in the Underground City of Montreal (32 km of passageway), the PATH system of Toronto (27 km of passageway) and the Plus15 system of Calgary (16 km of overhead passageway). Malls are an easy and convenient addition to society. With the presence of multiple stores in the same location, consumers can buy their material needs and wants without leaving the single overarching structure. Malls, however, are a symbol of materialism and are able to generate a wealth of capital simply by displaying itself as a social hub. 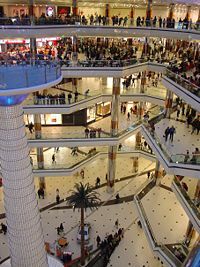 Many corporations place their retail stores in malls because of the large numbers of people visiting malls on a daily basis. Attractive window displays, customer greetings, and special mall sales all play a part in luring customers into spending money. Malls often house well-established franchises, eliminating competition from small businesses. As malls become larger, they reduce the customers' needs and desires for stand-alone stores, causing them to shop at malls where they are likely to purchase items they did not intend and thus spend more money. By bringing together popular franchises and chains, malls show the consumer what they should want and buy in order to elevate their social status and appearance. ↑ 2.0 2.1 Michael Baker, Pinpointing the Mall Population, International Council of Shopping Centers. Retrieved May 23, 2007. ↑ The Country Club Plaza. Retrieved May 23, 2007. ↑ Dennis R. Judd, "The Rise of the New Walled Cities" in Spatial Practices, ed. Helen Liggett and David C. Perr (Sage, Thousand Oaks, CA: Sage Publications, 1995 ISBN 0803951159), 144–168. ↑ Susan Geason and Paul R. Wilson, Preventing retail crime in shopping centres and malls, in Preventing Retail Crime (Canberra: Australian Institute of Criminology, 1992 ISBN 0642170479), 47–59. Retrieved May 23, 2007. Ngo-Viet, Nam Son. 2002. The Integration of the Suburban Shopping Center with its Surroundings: Redmond Town Center. University of Washington. Retrieved May 23, 2007. This page was last modified on 15 September 2015, at 16:45.